"Naturally" ALL NATURAL hard candy jewels, they contain NO artificial flavors or colors and make a perfect sweet treat. 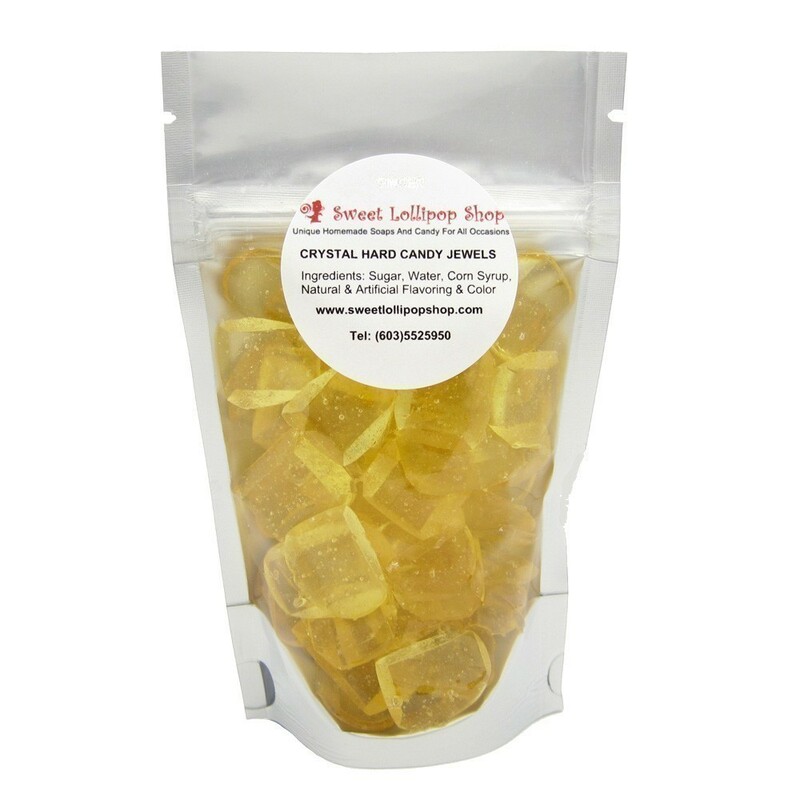 Perfectly bite size, jewel shaped crystal barley candy sweets, hand made in my licensed kitchen and packaged in pretty silver backed candy bags that reseal for freshness. Bag contains approximately 2 oz. of candy jewels. Crystal Jewels candy are also perfect for pregnant moms and anyone undergoing treatment causing nausea such as chemotherapy, as they provide a gentle boost of energy and help relieve nausea related with those conditions. AVAILABLE IN MANY VARIOUS COLORS & FLAVORS AND FREE FROM NASTY ARTIFICIAL PRESERVATIVES! LOOKING FOR AN ALL NATURAL CANDY? OUR LOLLIPOPS & JEWELS CANDIES ARE NOW AVAILABLE IN 21 ALL NATURAL FLAVORS INCLUDING STRAWBERRY, LEMON, LIME, ORANGE, WINTERGREEN, PEPPERMINT, NUTMEG, SPEARMINT, CLOVE, TANGERINE, POMEGRANATE, MAPLE, BANANA, ANISE, GRAPEFRUIT, ALMOND, BLUEBERRY, CARAMEL, CHERRY, CRANBERRY AND ENGLISH TOFFEE. Always in stock flavors are: Orange (natural oil) - orange Strawberry - pink Lemon (natural oil) - yellow Lime (natural oil) - green Cherry - red Cheesecake - yellow Bubblegum - pink Apple - green or red Maple - brown Raspberry - blue or red Watermelon - pink/red Root Beer - brown Peppermint - green (natural oil) Champagne - uncolored (perfect for weddings) Limited edition flavors include blueberry, strawberry banana, strawberry kiwi, cotton candy, orange cream, tutti frutti, honey, red licorice, hot chilli, and tangerine, please check for availability.